Just 1R taller than 8 inches--I held out as long as I could but—I wasn't feeling any love and even the addition of some extra cables and a fancy cuff couldn't hold my interest. They're casual clothes socks. They kind you wear to an activity when you don't care what you look like –I haven't vollunteered at a car wash in eons.. but well maybe helping some one move –these days—more likely helping some one after a death in the family when a house needs to be cleaned out. They look nice—but don't really match anything in my wardrobe. Ok-- I guess with a jeans skirt--(there is the gun grey color –the sort of looks blueish) or with a olive colored top (I have a few) or maybe a peach top (I don't have much in the way of real orange (and have way too many orange socks already –plus another planned—that have will have some orange in them). So far so good with socks—One pair in January, one pair in Februay. I am inching to start the next pair --only because I love the idea of them—Grey socks in a granite stitch-with viens of garnets (red beads) running through-- tribute to NYC—the Bronx particulary. 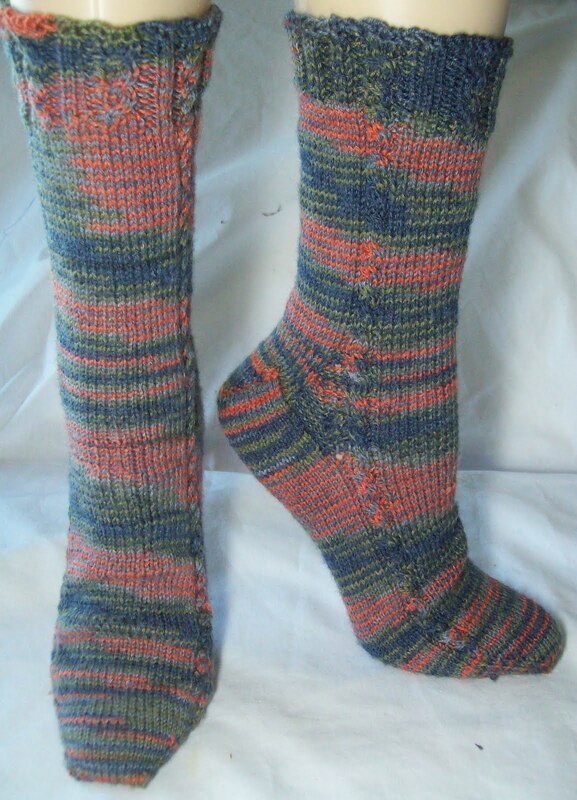 Meanwhile, these are not socks –5 inches of not socks—How quick it is to knit 5 inches on a size 8 (5mm) needle than on a size 1(2.25mm)! 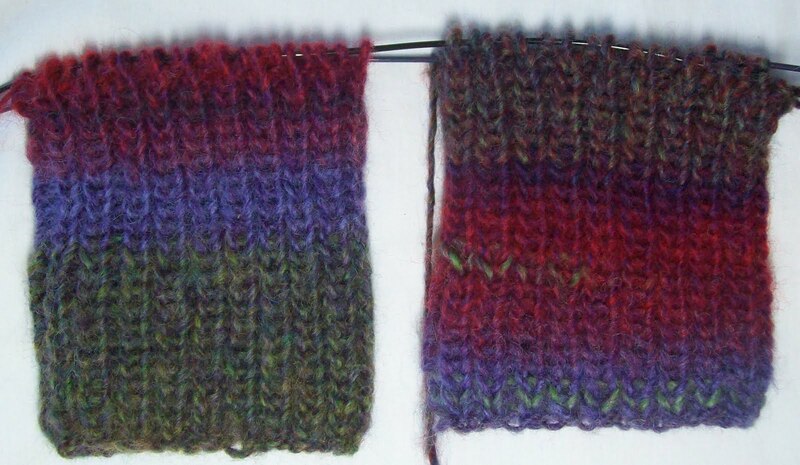 These are cuffs of a shrug--(I am taking notes) knit from cuff to cuff (only its not)—it will have a center back seam and some shaping in the back (and front) to provide the needed ease . I like (so easy, so simple) the idea of shrugs that are just long scarves that have buttons (or some fasteners, or are sewn) on each end to make sleeves. But I don't like them—not really. I don't like how the sleeves seam twists. (or worse finds its self center front on the sleeve) I don't like how the back always bunches up—as it must with out shaping. So my shrug is starts with nice deep ribbed cuffs—another 2 inches at least—maybe 3 (I am thinking 8 inches sounds about right—and right now there are 5 inches) Then the there will be a bit of pattern on the top of the sleeve, and increases (LOTS of increases) on the bottom of the sleeve –to make almost a bat wing type sleeve. At some point I will stop knitting in the round—one side will just stop (front) the other will have some shaping (for fit and for the neck) and the two pieces will be grafted together. Then a front and neck band, and a bottom band too. So—my granite and garnet socks will wait—but while I am knitting the shrug-- I need to get 1 (2, really) hats knit for the St Baldricks foundation, and another, (a child hat) for another charity project. Plus a pair of fingerless gloves knit, too (I started them, and didn't get an inch done before noticing a fatal flaw—the fancy cuff? I ended up with 2 right ones—not a right and left!) I have important hats, to knit too (original designs I want to knit and document) and... well as always, my plate is overfull of ideas!